There are a ton of 7 and 8 passenger vehicles out there to choose from, but what if you’re looking for a vehicle with seating for 6 passengers? Manufacturers are offering fewer 6 passenger options than they used to in order to maximize the capacity of their vehicles and attract a larger segment of the market. The options still out there either come standard with 6 seats or offer an option that reduces the number of seats from 7 to 6 and provides more room in the cabin. From SUVs and trucks to sedans, it can be difficult and very time consuming to narrow the list down to determine which ones are even worth looking at. To help you find the right one for the job, here’s an overview of the 8 best 2016 six passenger vehicles. If none of the 2016 vehicles on this list perfectly fit your needs, then it’s worth looking at the best options that are 1 or 2 years old and considering picking up a used one. Hyundai’s Santa Fe is an inexpensive mid-size SUV with a lot of value. It comes “out of the box” ready to tow 5,000 pounds, something almost entirely unique in its class. It’s also well-equipped compared to vehicles at a similar price point, coming with standard rear-view camera and steering wheel mounted controls. It has excellent second row captain’s chairs, providing ample legroom to comfortably seat two adults. The third row can be difficult to access, even in this configuration, and has limited leg room, so it’s best left for children or teens. The Santa Fe is powered by a 3.3L V-6 coupled to a 6-speed automatic gearbox that produces 290-hp and comes in either FWD or AWD. 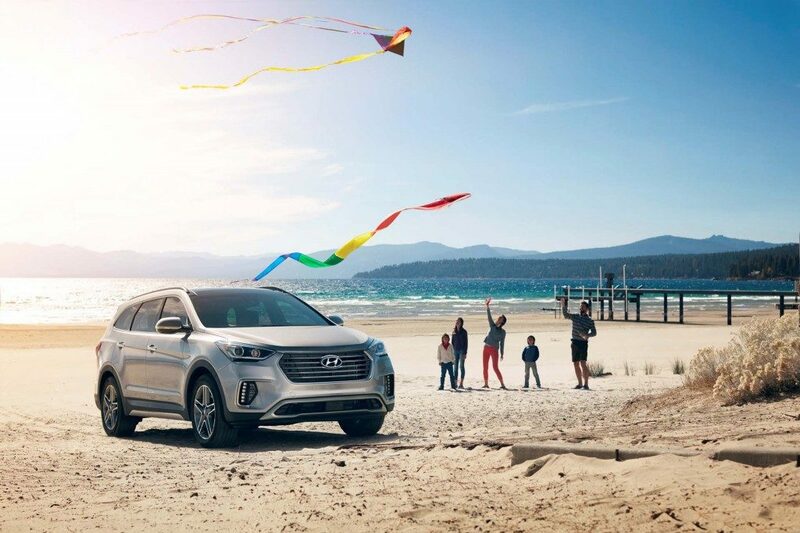 Since it’s solidly in the mid-size range, the Santa Fe handles well when cornering and has a smooth ride for its passengers. It also earns the distinction of being an IIHS Top Safety Pick+. Acura’s luxury SUV, the 2017 MDX, is one of the best handling vehicles in its class, combining comfort and driving enjoyment into an attractive package. Its second row captain’s chairs are some of the most comfortable seats found in any SUV, giving passengers seated there the same accommodations normally reserved for the front row. The third row can be difficult to access, though this is made slightly easier when equipped with the captain’s chair second row, and lacks overall leg room. That’s not surprising given the vehicle’s size, and the MDX can still transport six adults for short trips. The 3.5L V-6 AWD powertrain produces 290-hp and is paired to a 9-speed automatic. Like most 9-speeds hitting the market, it can get confused when shifting gears, but it’s usable and gives better overall performance than the old transmission. 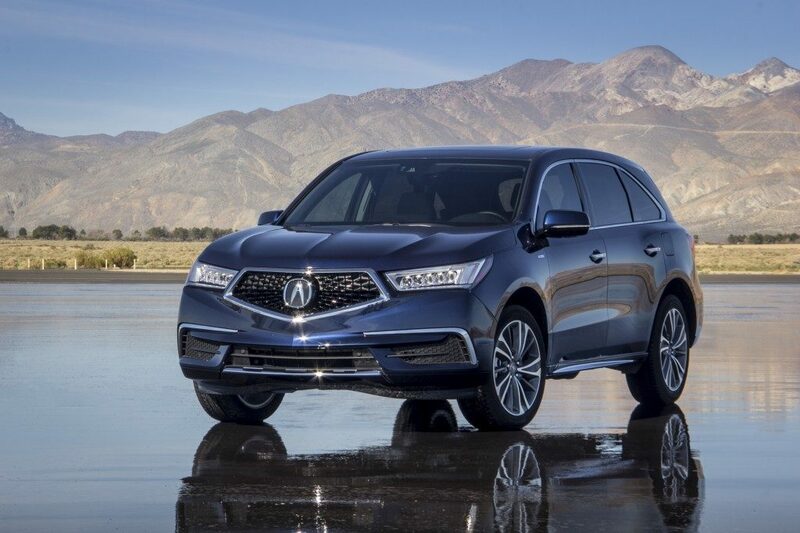 The AWD system in the MDX is packed with technology, providing what Acura calls mechanical torque vectoring to push the right amount of power where it’s needed most, improving handling and making the MDX one of the smoothest riding AWD SUVs available today. It’s also an IIHS Top Safety Pick+ and comes with a long list of available tech and safety extras. Tesla’s fully-electric SUV entry, the Model X, is a larger version of the technology packed Model S. Every conceivable advanced safety feature is present as standard on the Model X, including AWD, automatic emergency braking, a fully-functional autopilot, forward looking camera, radar, and 360 degree sonar sensors. The first and second rows are equally comfortable, with the Model X’s luxury captain’s chairs in the second row rivaling the comfort provided by the first row seats of luxury rivals. The Model X is not a big vehicle, and this is most noticeable in the third row, which most adults will find uncomfortable. There’s also the “love it or hate it” falcon wing doors, which can be problematic for some buyers. The Tesla X is one of the fastest vehicles not just in the SUV class, but anywhere. The base model 75D will do 0-60 in just 6 seconds, with a class-leading 237 mile range. Going up from there in both performance and price is the 100D, capable of a 2.9 second 0-60 time and quoted to produce a staggering 762 horsepower. That’s in the realm of hypercar speed and power, an impressive feat for a family focused SUV. Offered in a dizzying variety of trim and powertrain configurations, the Ford F-150 is the best selling truck in America. New engine options, including a 3.5L turbocharged V-6 coupled to a brand-new 10-speed automatic, give the F-150 even more flexibility than it had before, and a remarkably smooth and composed ride keep this workhorse occupants comfortable. Most F-150’s will be equipped with either the standard 3.5L V-6, or the 2.7L turbo V-6, making 282 hp and 325 hp, respectively. 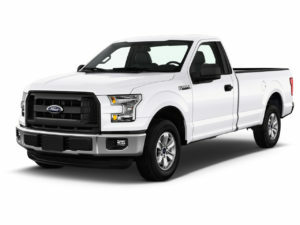 Of the two, the turbocharged 2.7L is the preferred option, costing only slightly more and getting the best fuel economy of the F-150’s engine options. 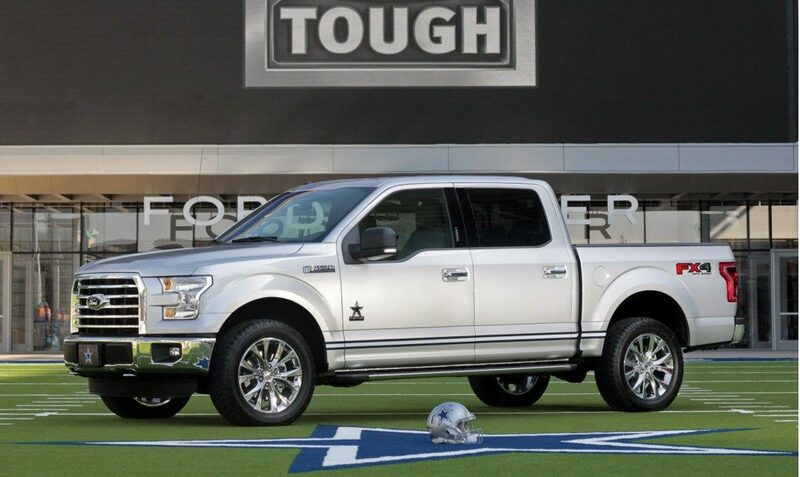 When properly equipped, the F-150 can be rated to tow up to 12,200 pounds. In the largest of crew cab options the 2017 F-150 will comfortably seat four, with room for two more in a pinch. The rear seats have plenty of legroom, and the seats themselves can be folded up to create even more storage space. 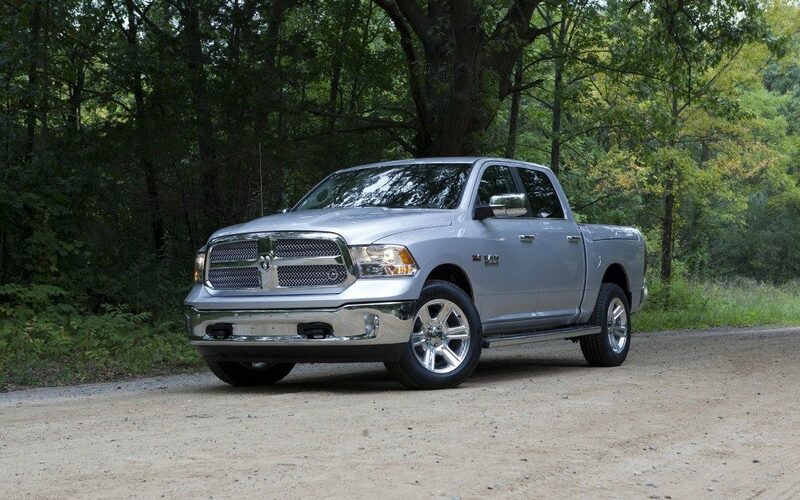 The Dodge Ram 1500 is one of the oldest pickup truck models still in production today. Featuring aggressive styling, a long list of configuration options, and big muscular V-8’s, the Ram is a pickup truck in every sense of the word. The base 3.6L V6 creates 305-hp and is a solid option. It’s rated to tow up to 7,600 pounds and is mated to an 8-speed automatic. Consumers looking for even more power will want to consider the 3.0L turbodiesel V-6; it only makes 240-hp, but produces 420 lb-ft of torque, allowing it to tow up to 9,200 pounds. It also gets excellent fuel economy. 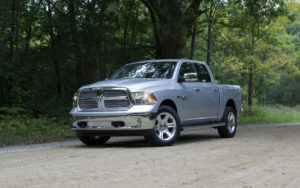 The Ram 1500 handles like a big truck, and while the ride is smooth, it can get bumpy at freeway speeds. Thankfully, there’s plenty of comfortable space to sit, with the largest crew cabs easily fitting three in the front row and three in the back. There’s plenty of legroom in both rows and the rear seats fold up flat for additional storage space when seating isn’t needed. 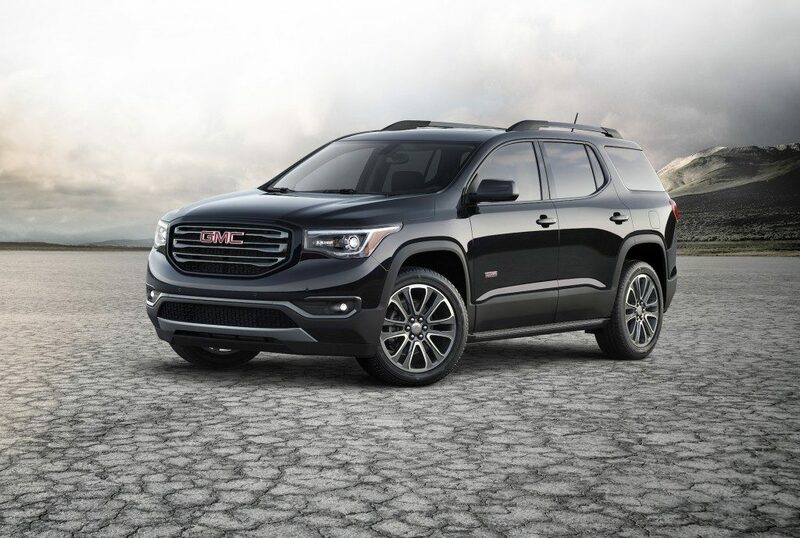 Downsized from last year’s full-size model into a smaller, more family oriented vehicle, the 2017 GMC Acadia has successfully shifted its focus to a family friendly people carrier. A small 2.5L 4-cylinder comes as standard, and it performs well enough for daily driving. When fully laden it can begin to chug, and buyers who plan to frequently fill up the Acadia will want to spring for the larger 3.6L V-6. A traction selection system comes standard on all Acadia models, allowing drivers to select a variety of modes for improved handling while towing, going off-road, or in rough weather. The Acadia can be equipped with second row captain’s chairs, for a total of six seats. Adults can fit into the third row for short trips if necessary, but should really stick to the first and second rows for longer trips. Seats can be folded down for additional space, but when all three rows are up the Acadia’s shorter chassis really hurts for cargo room. 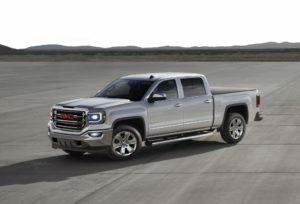 Built on the same frame as the Chevrolet Silverado, the Sierra is a slightly more upscale version of that vehicle. Base models are still quite spartan, but more high-quality materials can be found here than in the Silverado. The standard 4.3L V-6 is a good engine option, with the big GM corporate V-8 also being available. The V8 can tow up to 11,100 pounds, and both engines come with 6-speed automatic gearboxes and RWD or 4WD. The Sierra looks great on the outside, with distinct styling and strong lines. The interior also looks and feels great, with plenty of in-cabin storage and places to put tools. With the largest crew cabs there’s plenty of legroom in the back seat, which can flip up for additional storage. 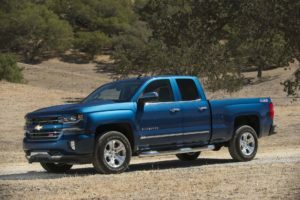 Largely unchanged from last year, the Chevrolet Silverado is the second best-selling vehicle in America. With just as many configuration options as Ford pickups, the Silverado can be tailored to suit almost any need, including hauling people, towing trailers, or filling up the flatbed with cargo. The same 4.3L V-6 found in the Sierra is the standard engine for the Silverado, with the popular GM 5.3L V-8 also available. The larger V8 produces 355-hp and will tow up to 11,100 pounds. Both engines are paired with a 6-speed automatic gearbox and have RWD and 4WD powertrain options. The base model Silverado’s have very basic interiors, but going for higher trims and available extras will quickly create a very comfortable and well-equipped pickup. The list of available extras is even longer than the various trim configurations, letting drivers customize the vehicle they’d like to use as a daily workhorse. Crew cabs feature spacious second row seats and very large, comfortable bench seats in the front row. 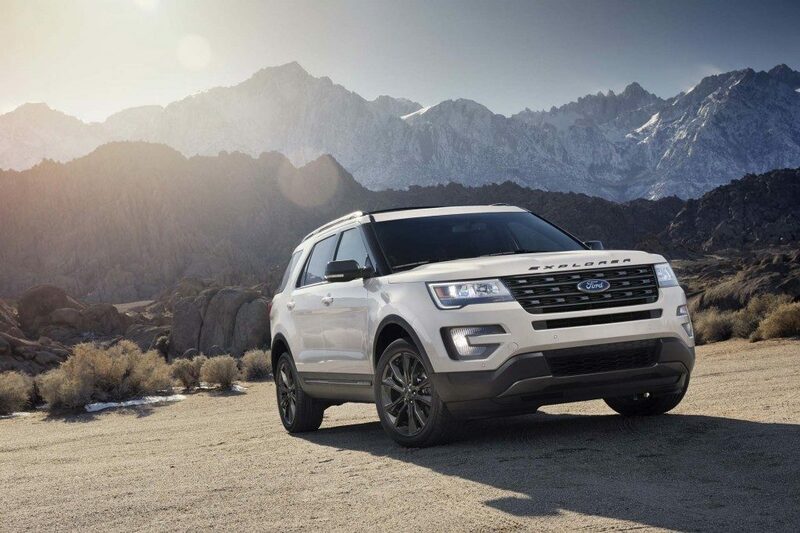 A well-rounded SUV, the Ford Explorer shifted its focus this generation from being a rough and rugged mid-size SUV to a family-friendly crossover people carrier. That’s been a well-received change, giving the Explorer the capability to haul people or cargo with a sedan-like ride quality and decent fuel efficiency. The 2017 Explorer features several engine options, with the standard 3.5L V-6 being adequate for daily driving. Two turbocharged offerings are also available, a 4-cylinder and a V-6, and many Explorer buyers will find these to be the better options. Both FWD and AWD can be selected, but may be limited based on trim. Front row seats in the Explorer are top-notch, and the SUV’s quiet and composed ride will keep all its passengers safe from rough roads. The second row has plenty of leg and headroom, but the third row is not only hard to access, it lacks in both leg and headroom. 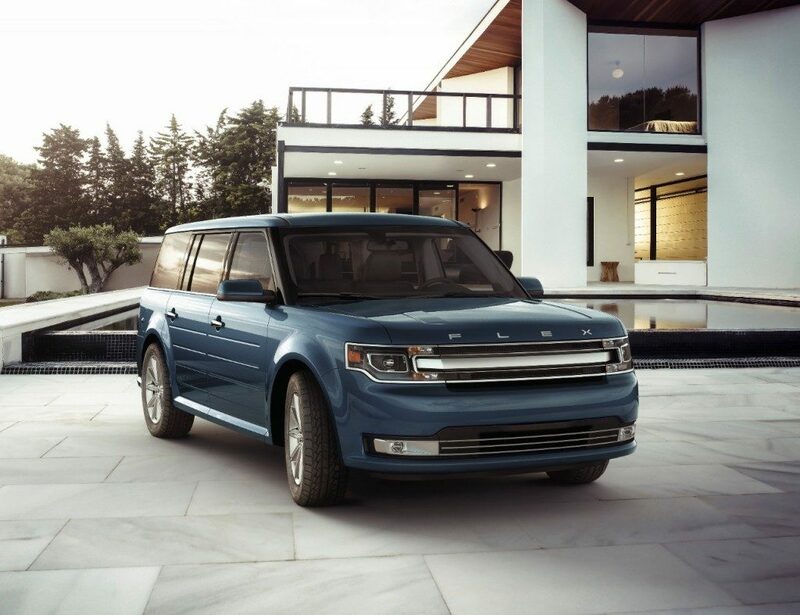 A uniquely boxy design, the Ford Flex uses this unconventional exterior to maximum effect, creating a spacious mid-size SUV with room for people, cargo, and more. The base model engine is a 3.5L V-6 producing 287-hp, and that’s more than enough to get the Flex around the freeway while fully loaded. Buyers looking for even more power can spring for the turbocharged V6, making 365-hp for only a small dip in fuel economy. Both engines are mated to a 6-speed automatic gearbox. The Flex not only handles well for an SUV with so much space, it’s fun to drive as well. Ford’s suspension on the flex makes fast cornering a breeze, and the vehicle feels planted at any speed. The spacious interior owes all its credit to the “love it or hate it” boxy design, and passengers in the second and third rows will be thankful for the Flex’s deviation from the norm. The third row seats themselves aren’t overly comfortable, but there is sufficient legroom to seat adults. 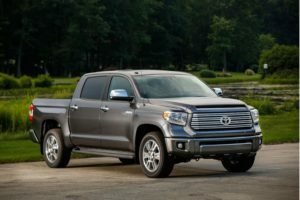 Toyota’s workhorse pickup model, the Tundra, features just as many trim options as its American counterparts, allowing the Tundra to be custom-tailored to fit almost any task. Toyota only offers two engine options, both V-8s. The smaller 4.6L V8 produces 310-hp and is rated to tow up to 10,000 pounds, but it will begin to struggle closer to 8,000. The larger 5.7L V-8 is worth the asking price, but will take a dip in fuel economy as a result of its size. 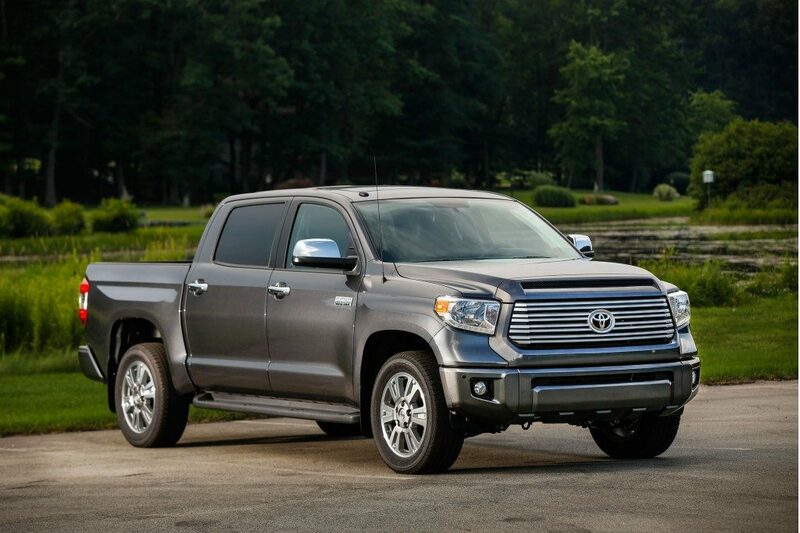 The Tundra is as wide as a pickup can get while still being considered a light-pickup. This creates plenty of room in the first and second rows of the Tundra, letting adults sit three across in both rows. The second row is a real highlight here, giving passengers as much leg and shoulder room as would be found in an SUV. We’re interested to know – which of these vehicles are you most interested in and why? Let other readers know by leaving a comment below!